"Could Be" Charming!!! Classic Colonial with lemonade porch on deep, level lot. 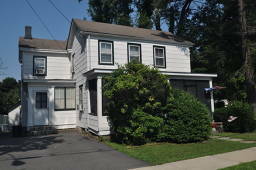 Conveniently located on quiet street within walking distance of shopping, dining and transportation. Good sized rooms with hardwood floors, original wide plank flooring on 2nd level, plenty of storage in basement, attic and 3 outbuildings/sheds; newer furnace, HW heater and roof. LOT IS 276 FEET DEEP AND BACKS UP TO KINGS SUPERMARKET/DEL'S VILLAGE. HOUSE BEING SOLD "AS IS"; needs a little TLC.